Mexican fibre or Tampico as it is also known, is a natural plant fibre which comes from the spiny, cactus-like lecheguilla plant that grows wild in the semi-desert upland areas of Mexico. The fibre is extracted by scraping away the pulpy matter from the freshly cut leaves. This soft texture fibre distinguishes itself by its great elasticity and resistance to temperature change up to 140ºC, as well as to acids and caustic soda, and its fineness for polishing and grinding. Tampico’s best property is its capacity to hold water, which is 65% more than polypropylene. More aggressive than nylon or horsehair and completely bio-degradable it is typically used for removing surface particles and tool marks, dusting, wet scrubbing, cleaning, and spreading liquids. Excellent for removing light feather burrs and for light edge blending when used with a compound. Available in natural cream colour. 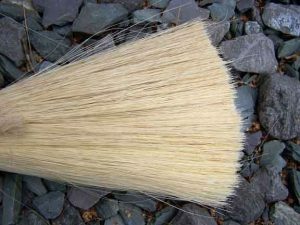 A blend of natural fibres including Tampico and the thicker, more abrasive Bassine from the stalks of the Palmyra plant.